Mango Delight recipe by Nadia Aslam at DesiRecipes.com. Delightfully sweet mango dessert made with cake, custard and cream. Half the madeira cake and use half only. Slice the madeira cake into small square blocks and arrange at the bottom of the bowl. Pour a 1/4 of the double cream roughly over the cake. 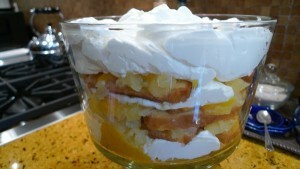 Now cut the mango in small blocks and put over the cake thats covered with cream. Again pour some cream over the top. Then open the custard and pour evenly over the contents. With the remaining cream pour over the top and chill for an hour in fridge.